The Methodist missionary is considered to be the first to preach the gospel within the Village of Clarkston. In 1834, Reverands Davidson and Cansar arranged the foundation of the Methodist church in the town. Early services were held in barns, school houses, and private homes. Since the Methodists were the first to preach the gospel in Clarkston, it was not of concern what denomination one was, but that they had a Christian spirit. In 1845, there was a remarkable revival led by Rev. Ruggles in the eastern part of the township where men of all Christian faiths left behind their farming duties and attended to their spiritual interests. Following this period, there was difference in opinon among believers in various denomination doctrines. Those who expressed a favor in the doctrine of Presbyterianism split away and desire to build their own house of worship. 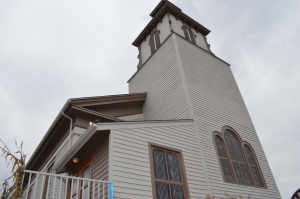 The First Presbyterian church of Clarkston was thus built in 1854 to satisfy the Presbyterian believers of the township. The first Baptist Church was built in 1847 for a congregation that had held meetings prior in the schoolhouse. There have been a number of revivals that affected the First Baptist Church and allowed for many to become members in the church. The Baptist Church is no longer located at this location and has since turned into the Clarkston Union Bar and Kitchen, a popular restaurant featured on the Food Network. Following the successful works of the Methodist missionaries in the 1830s, a project to build a church was taken on in 1841. The society had difficult affording the payment to build the church and could not purchase glass for the windows. Thus, the building was used only when weather permitted, otherwise the meetings were still held in the schoolhouse it had used previously. In 1873, a second building was built for the church to be located. The church was successfully built and maintained a membership of faithful adherents.